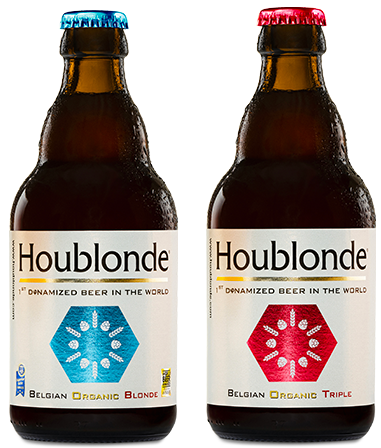 The recipe used to create HOUBLONDE was developed with the assistance of the Brewing Science and Technology laboratory at UCL (Catholic University of Louvain-La-Neuve, Belgium). This is the oldest university brewing institute in the world, with centuries of expertise under its belt! The HOUBLONDE is brewed in a traditional way at the Brunehaut brewery in Belgium which was founded in 1890 and which combines tradition and modernity. Did you know? The world of brewing likes to respect traditions. HOUBLONDE is brewed in the traditional way, under the benevolent eye of St Arnould, the patron saint of brewers, in authentic copper vats. « It always makes us proud to serve our friends a Belgian beer that is truly traditional and ecological. It’s just the great and right taste that we are looking for! » – Elisabeth and William, 45 and 51.